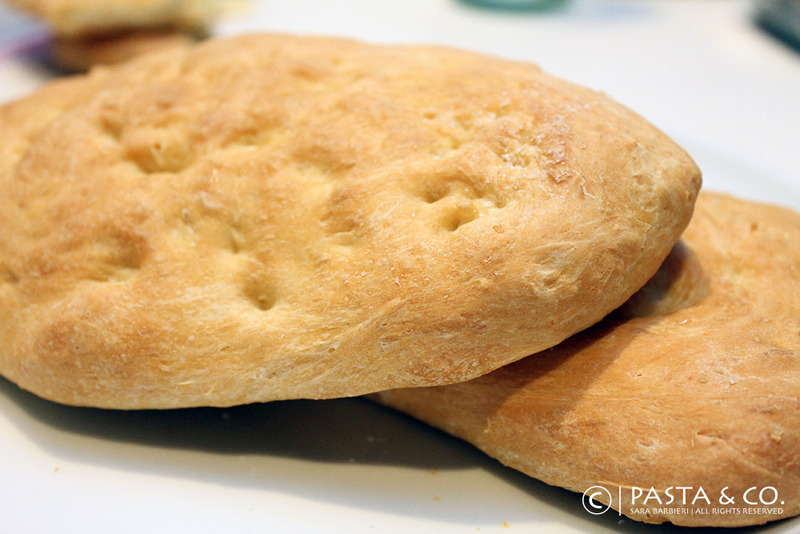 How To Make Fresh Bread At Home | Pasta & Co. In one of my recent posts, I told you I was trying to find the perfect recipe to bake fresh bread. Now, it took me longer, because we moved and as you know new ovens need much love and a formal agreement before baking anything. Last week I prepared the Carnival Tortelli, and as it’s the same dough as for the puffs (pate a choux) I gave it a try and they turned out wonderful. Those puffs are so delicate that can be the nightmare of every oven (and home cook). So, the oven’s fine. After five times that my baguettes, ciabatte and pagnotte come out perfect of the oven, I can say I got it. Freshly baked bread is one of life’s greatest simple pleasures. And it’s much easier than you might think. Here’s the recipe for fresh bread, pizza, focaccia or anything with bread dough you want to make. Try it out and find your science at it. Warm up the milk in a saucepan. It must be warm — not hot, otherwise you’ll kill the yeast. Pour the milk in a mixing bowl and dissolve the yeast in it and add a tsp of sugar. In another bowl, mix the flour with the salt. When the yeast is completely dissolved, add some of the flour with your left hand and work it in with your right hand (or the opposite if you’re left-handed!!). Add olive oil, mix and keep on adding the remaining flour working the mixture with your hand. When the flour’s finished, transfer the dough onto a wooden board (even a bamboo board is fine. only don’t use epicurean boards – which are awesome by the way but not to knead as they won’t absorb humidity). Knead for 2 minutes or so. Press on the dough with your hands, fold it in half, turn it by a quarter turn and press it again. It must be a smooth, airy dough. If it sticks to your work surface, sprinkle a bit more flour — but keep in mind that you must limit the amount of flour you add to the dough to make sure your bread doesn’t become heavy. If you plan to make pizza or a focaccia, take your baking sheet, roll the dough out pressing with your hands and using all of your fingers together to create little holes. Cover it with a clean towel and store it somewhere warm (in a just-warm oven for example). See recipe here. If you want to make one big loaf as a baguette, take a big bowl (glass or plastic), sprinkle with some flour the bottom of your ball and put it in there. Cover with a damp cloth (use warm water) and let it rise like that. Mind that when the dough grows, it may touch the towel. Check it frequently so that doesn’t happen. If you want to make panini or ciabatte, divide the ball in the amount of little balls you need and let it rise. When the dough is ready shape them up as you like. This all dividing process is to avoid breaking the bubbles. Think of the dough as a live thing. When your dough rises, it develops bubbles, capillaries and tissues. Don’t break them. You can let the dough rise from a minimum of 4 hours (pizza or focaccia) to even 24 hours (if it’s bread). If you try the 24-hour thing, mind that temperature change can be a downfall – if you store the dough in the fridge, for example, give it enough time to go back to room temperature before putting it into the oven. Pre-heat the oven to 392 degrees. Bread: grease the baking sheet, shape the bread and cook until it gets a nice golden color. You may want to try it with EVOO and oregano. Or maybe a bruschetta? Pizza >> See recipe here.